Well, it is running a wee bit behind schedule, but Chrontendo Episode 11 is finished and available for download. What's in store this episode? A pretty nice selection of games, actually. I've said it before, and I'll say it again, but of all the third party publishers, Konami and Hudson are the ones really putting some effort into their games. By Fall 1986, both publishers had mastered the art of original games for the Famicom, in ways that others, such as Jaleco, Sunsoft, Square, and even Namco and Taito, have not. This episode also sees the first great game for the Famicom Disk System that was not released by Nintendo themselves. The system is slowly coming of age, with six FDS games being released this episode. By end of the year, new FDS games will be coming out one after the other. Classic platformers don't get much cooler than the orginal Castlevania. Light years ahead of most other recent Famicom platformers, this Konami release combines rich graphics, atmospheric music and imaginative level design. 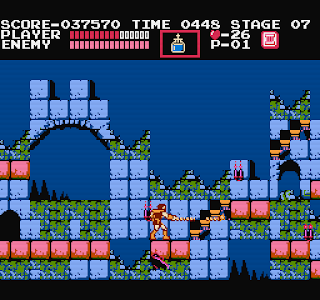 Castlevania eschews the typical cutsey style of most post-Mario side-scrolling platform games, instead opting for a spooky, gothic horror themed game set inside a decaying, monster infested castle. Your character, Simon Belmont, makes his way through six levels, each quite different in design and with a unique boss at the end of each. The bosses are one of the most impressive elements of the game. At a time when repeated or virtually identical bosses where commonplace, each of Castlevania's bosses are completely different in appearance, attack pattern, and weakness. While some might fault the game's controls as being unforgiving, they are still massively superior to the sloppy controls found in such games as Atlantis no Nazo or Gegege no Kitaro. Admittedly, this Hudson release is not in the same league as Castlevania. 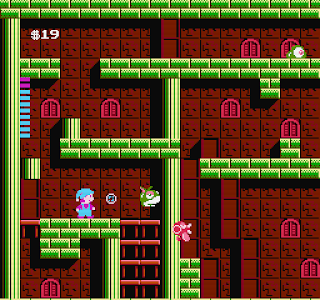 Milon's Secret Castle is a carefully designed, cute and fun puzzlish platformer built around a musical theme. Strangely similar to Castlevania, the object of the game is to ascend floor by floor, room by room, to the top of the titular castle. Each room can only be exited by finding a sufficient quantity of hidden items. While not without flaws, Milon's Secret Castle is a quality title. Capcom finally ditches Micronics and ports their 1985 arcade hit themselves. The results are not quite as impressive as you might hope, but you still end up with a pretty good vertical action game. Furthermore, Commando inaugurates the Capcom tradition of adding additional gameplay elements to console ports. After two previous attempts someone finally releases a decent wrestling game for the Famicom. Unsurprisingly, that someone turns out to be Nintendo themselves. Not really a good game, but notable for debuting Bandai's Family Trainer series. These games were designed to be used with the Family Trainer mat, on which the player stood and controlled by moving around. Nintendo was apparently quite pleased with the idea, since they released it themselves in the US as the Power Pad. Curiously, Nintendo is now reviving the idea as the Wii Fit. Based on a popular manga/anime series, this Jaleco title was released in arcades as Momoko 120%. Not a fantastically horrible game, Urusei Yatsura is just a little on the annoying side. The fact that it's ending up in Episode 11's "bad game list" just shows the relatively high quality of the games this time around. It's probably a little unfair to throw this quickie educational release from Tokyo Shoseki on the list, but it's actually less intereting than the previous three Sansuu games. They've even cut the number of games on each cartridge in half! Terra Cresta: Pretty decent port of this classic vertical shoot-em-up from Nichibutsu. Buggy Popper: Port of the old arcade game known as Bump 'n' Jump in the US. Othello: An Othello video game from the mysterious publisher Kawada. Japanese text adventure game for the Famicom. Super Star Force: Kemco's lame sequel to Star Force. Not nearly as good as Hudson's sequel to that same game. Mississippi Satsujin Jiken: Port of Commodore 64 adventure game Murder on the Mississippi. I am a Teacher - Teami no Kiso: The second knitting instruction game from Royal Kougyou. Well there you have it! Go ahead and download or stream Episode 11 here. Seems like something they'd put on a computer than on a game console obviously, but it's nice to see what they tried to do with the Famicom here. 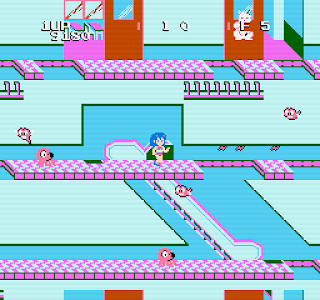 Apart from the changes made to the arcade version (Momoko 120%), the music itself is nearly identical to that of Urusei Yatsura's first opening theme song. There's a full description somewhere that mentioned the game's premise involving how an earthquake wreck the high school Lum and Ataru (the boy who is engaged to marry Lum in the series despite his lecherous attitude and interest in other girls) go to and so Lum has to somehow go back in time to correct these things while a fire is raging from the basement. At least I think that's the gist of the game. There's some hidden items to find during the floors of the buildings, one of them I think introduces a giant cow-tiger-like creature known as "Rei" who comes out to eat up the guys flying through the corridors. Rei himself is actually Lum's other acquaintance from another planet who wants to marry Lum instead, but his temper often gets the better of him. The cat thing that shows up is another character from the show that is a ghost of a cat who died one winter day and who often is seen warming himself on a kotatsu (http://en.wikipedia.org/wiki/Kotatsu ). I do have a copy of this game but don't have a Famicom yet to play it on (I hope to get one soon). At least you thought it was an OK game over the way the Angry Video Game Nerd chose to rank it. Sky Kid: The game is actually a lot better if you know about one of the little controls that, unfortunately, the Famicom/NES version doesn't tell you about. (There is an onscreen instruction for it in the arcade.) When you are shot or struck by an enemy, you aren't actually dead yet. Pound on the buttons and spin the controller and you can pull out of the dive! Every time you get hit during a life/level, you have to hit the buttons a little more to pull out of it. If you strike the ground before pulling out you lose a life. This makes ground targets a lot more dangerous to go after than air targets, by the way. - Loop over a sun or moon to change day/night to the opposite. - Loop by the Statue of Liberty's legs to make her skirt fly up! - Loop over one of the giant angel/Pac-Man signs to make an item appear. A medal is worth points; a bottle (beer?) makes you crash and die immediately. - Loop over the blue-dressed ladies on the ground in some areas to make them emit hearts that are worth points at the end of the level. Sky Kid also has a nice two-player co-op mode. And the game is nice in that it's fairly long and difficult, but it keeps introducing new features along the way. I don't think I've ever seen everything it has to offer. Overall, an excellent port. Castlevania: I noticed that your video was playing more slowly than normal, and that you used save states a lot in that one. Again, you have a lot of games to get through and want to finish these in a timely fashion, and Castlevania has driven grown men to their knees weeping. I have played Castlevania enough to be able to get through the game fairly consistently on one "credit." Like many other Konami arcade games/ports of the time, the game "loops" once you finish it, getting harder every time you beat it. Castlevania's second loop is much harder than the first, enemies are faster and do full damage from the start, but there are also new secrets and even some extra lives to find. Commando: The more I play this game the more impressed with it I become. It turns out there are secret passages all over the place! The game keeps track of the prisoners you save, and if you get them all in a level you get special bonuses at the end! There are also some devious boobytrap rooms: the "Gas Room" forces you to bomb open a randomly-placed exit passage before a timer runs out or you lose a life. There are other passages with hidden exits; if you don't find the exit before running out of grenades you die. And some enemies, like the snakes, only appear underground. There are also illusory walls in some passages, which sometimes hide huge point bonuses. Also, it's possible to earn powerups by rescuing certain prisoners. You found one in the video; it offered infinite grenades I think. There's also a grenade powerup (extends blast size) and a machine gun powerup (speeds up shots and increases range). Finally, although finishing all four levels causes the game to loop, it doesn't do so indefinitely. There are only four loops; the game does end after the last one. The secret passages are different in each loop! Terra Cresta: Appears to be a sequel to an arcade game called Moon Cresta. Did you know that you can create short urls with Shortest and get dollars from every click on your shortened links.